My requirement is that for my Azure devops release pipeline I want to tag a specific commit with an annotated tag which contains the build number and the date (which is auto-set on an annotated tag). The task (ignore what's in the script box right now) will use the Azure Subscription that I have set in order to authenticate towards the Azure DevOps REST API. I have successfully been able to perform the task I want using a personal access token (PAT) but this is not stable long-term for a whole team and I want to use our Azure Subscription. My problem is that I'm not sure how to use the authentication of the Azure Subscription correctly. I seem to get some data using Get-AzureRmContext (see current code below) and then I found a GitHub issue which seems to do sort of the same thing. The code gets some kind of OAuth token but using the code below, Azure still returns to me that I need to sign in, so I assume it's not the correct token. I don't understand how things hatch into each other. Note that my subscription should have all the permissions it needs to do what I want. Not the answer you're looking for? Browse other questions tagged powershell azure-devops azure-pipelines azure-powershell azure-devops-rest-api or ask your own question. 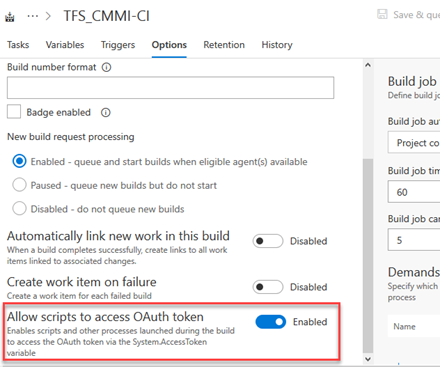 How can I run a Python script in Azure DevOps with Azure Resource Manager credentials? API for automating Azure DevOps Pipelines?